Fiber rush is easier to use and outlasts natural rush. 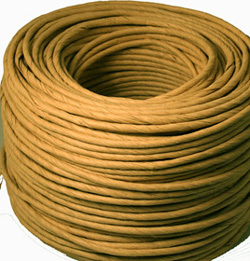 Our fiber rush is made from the highest quality paper and is a continuous strand to make your weaving projects easier. Perfect for chair seats, footstools, bar stools and more. Brown color matches many antique seats for restoration projects. 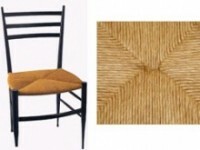 It is suitable for replacing any type of round woven material on chairs that have rung or dowel construction like the chair shown at right. It comes in 2 pound coils and two diameters. We also have Fiber Rush seat Weaving Kits which includes one coil of Fiber Rush in your choice of sizes plus our Fiber Rush seat weaving booklets. Like all of our how-to weave booklets, it has step-by-step instructions with many details illustrations. 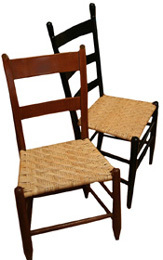 The average 13 x 13″ chair seat requires 2 pounds. Tools needed: tacking stapler or hammer and small hardware tacks for attaching the rush to the inside of the frame, scissors to cut the material, a T-square or carpenter’s square to check the pattern’s straightness, a screwdriver and mallet to tap the rush into place, and a 4″ clamp. Weaving Tip: Be sure to keep the materials tight as you weave. The tension in the strands is what creates a perfect looking seat. Whenever you need to leave your project, use a 4″ clamps to hold it to the rail. Be careful not to crimp or flatten the rush with the clamp. History: Fiber Rush has been used to replace bulrush or twisted cattail leaves which are the equivalent weaving material used on museum chairs. Bulrush and twisted cattail leaves are not only very difficult to weave with, but very expensive. For this reason, fiber rush and twisted seagrass as used instead. Fiber rush is a twisted paper but is very durable. Ours is Made in the USA for absolute reliability. In addition to Fiber Rush supplies, we also have tools and How to booklets.